We have reliable, legal, and secure payment procedures through which clients can make purchases. We maintain a high level of transparency and ensure to maintain proper documentation. We are committed towards providing the world-class lot of products thus, check each and every product on different levels. 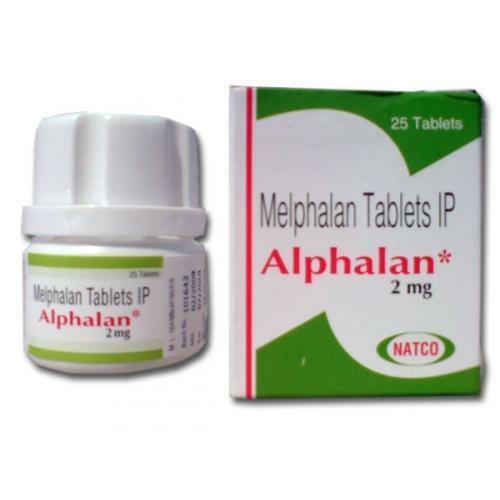 Alphalan contains Melphalan.it is used in multiple myeloma,breast carcinoma,advanced ovarian carcinoma,polycythaemia vera, Neuroblastoma, Melanoma, soft tissue sarcoma. Chemotherapy primarily refers to the treatment of cancer with an antineoplastic drug or with a combination of such drugs into a standardized treatment regimen. Certain chemotherapy agents also have a role in the treatment of other conditions, including ankylosing spondylitis, multiple sclerosis, Crohn's disease, psoriasis, psoriatic arthritis, rheumatoid arthritis and scleroderma. The most common chemotherapy agents act by killing cells that divide rapidly, one of the main properties of most cancer cells. This means that chemotherapy also harms cells that divide rapidly under normal circumstances: cells in the bone marrow, digestive tract, and hair follicles. This results in the most common side-effects of chemotherapy - myelosuppression (decreased production of blood cells, hence also immunosuppression), mucositis (inflammation of the lining of the digestive tract), and alopecia (hair loss).